Whether you are visiting this site for the first time or returning... Thank you for your interest in our school and Welcome! Welcome to the Community & Family that is Village Gate Children's Academy! Village Gate Children's Academy is a private school with Kindergarten, Elementary and Middle School Programs based on the teachings and philosophy of Maria Montessori. 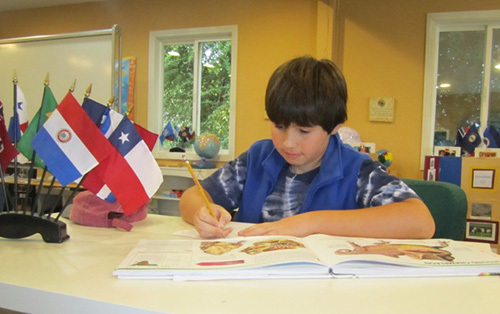 Our extensive experience and knowledge of the elementary and middle school-aged child, allows us to create a learning environment that sparks the child's imagination and fosters their innate love of learning. Our programs are designed to optimize the individual learning styles and needs of our students by creating individual lesson plans and an environment filled with materials and learning opportunities. Our classrooms are a beautiful balance of individual activities and the cultivation of a classroom community. Although we relate to each child as an individual, we remain committed to ensuring state and national academic standards are met. Our curriculum is rich in Mathematics, Language, Culture, Geography, Science, Botany, Zoology and History. In addition, we offer art, music and technology with a physical education that includes weekly swimming and pilates. We believe that partnership is vital to a successful learning environment. Partnership between home and school, between teacher and student and among our students. We believe that a common language between home and school with regards to discipline and problem solving is important. Therefore, our school follows the Joy of Parenting model of discipline and we ask our families to do the same. As you explore this site, it is our hope that you are left with a taste of what Village Gate Children's Academy stands for, believes in and provides for the students and families that come here. Any person whose journey has led them through Village Gate Children's Academy will tell you that, in addition, to the excellent education and the strong foundation that is developed in each child, the most outstanding quality of Village Gate Children's Academy is the strong sense of Community! This community runs deeply throughout the school and is one with a common goal... a goal to provide the best possible environment for our students to be able to grow and continue to develop their sense of themselves and the world around them. It's true that it does take "a village to raise a child". Village Gate Children's Academy embraces that notion and lives it as a core belief and value. So, once again... Welcome! Enjoy the pages that follow and if in the process, you find yourself excited, intrigued and with a sense of wonderment, we have truly succeeded in giving you a sample of what Village Gate Children's Academy is all about. We invite you to call or stop in to fully get the Village Gate Experience for yourself, because that is what a Montessori environment is all about!